Accredited for our wide range of products, we are offering premium quality Geeta Quran Stand. Leveraging on our extensive market knowledge, we are providing a high quality range of Quran Stand. We are engaged in offering a comprehensive line of Wooden Rehals that is fabricated using high grade raw materials. 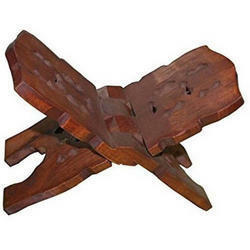 Our array of Wooden Rehal is beautifully designed and can be availed in varied designs. Made up of high quality wood, these items are apt for keeping the religious books safely. Besides, these rehals can be availed at the most economical prices. 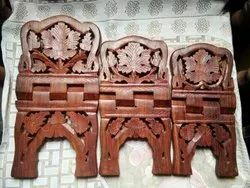 We are providing wooden rehel, which can be used for reading books. Used historically for many a generation, this elegant and pretty Wooden Qur'an holder (a.k.a. rehal, rahil, or tawla) is used by students and reciters of the Quran. It is helpful for children and adults to recite the Quran in proper form and function. To meet the ever-changing requirements of our clients, we are engaged in offering a commendable array of Wooden Rehal. Wooden foldable Rehal with the deep carving it can be foldable into bookshop. Its totally handcrafted and seasoned wood it can be available in many other shpe. Carved wood book holder. Use on the Altar to make reading rituals, spells, chants and instructions from reference books much easier, so you can be read without any disturb. It is easy to hold anywhere as you like.